The Aderans Group carries “heartfelt service” as one of the management philosophies that it “aims to achieve”. We would like to introduce some of our activities, which involve the entire company as a united body and are deployed to raise the satisfaction level and trust of our customers. Since September 2002, the Aderans Group has been organizing barber shops and beauty salons at hospitals and offering various support to patients with delicate issues over their hair due to their illnesses and treatments. The shops have been made barrier-free so patients can come in wheelchairs. Mobile salon chairs have been adopted at all shops in consideration of patient conditions, so that we may be prepared to move anywhere within the hospital. As of January 2019, there are 31 in-hospital hair salons. In-house salons at hospitals have been introduced in Germany, Denmark and Sweden since 2011. This project is well recognized in Japan. Also, we will introduce this system into US. As of January 2019, there are 8 in-hospital hair salons in Europe. In September 2017, we started handling Gunze's low irritation innerwear, "Medicure," at our in-hospital hair salon. Previously, "Medicure" brand sales were only over the phone or through the internet, but many patients and medical staff had requested products they could touch. Now, we deal with the product in a way that they can touch and see them directly at the hair salon in the hospital. Lifenet Insurance Company and our company started a partnership in January 2018 with the aim of building a support system for cancer patients and promoting the understanding of medical wigs. With this alliance, we will cooperate in establishing a support system for cancer patients in terms of appearance care in the "Cancer Life Support Service" provided by Lifenet. Sharp Corporation and our company jointly developed a hair dryer, the "N-LED Sonic," and released it in October 2017. This product is a new concept hair dryer that gathers Sharp's proprietary technology, "Plasmacluster," and "N-LEDbeam ™" developed by our company, and applies it directly to the hair and scalp. "TEAM Rafra" was developed in collaboration with the cancer patient's life support company VOL-NEXT Co., Ltd., and was released in June 2018. Using VOL-NEXT's needs and know-how, as learned from about 200,000 patients, this product is a set of two; one for the workplace, and one for households. Female cancer patients can wear it at work and at home, throughout the day. OVE is a life creation space operated by Shimano Corporation. In June 2018, it became a venue for a concert by Cellist Ohmae. On that day, we also introduced our CSR activities and tried on wigs. It has become a place to explain the charm of wigs, while incorporating the healthy and affluent lifestyle that is a common concept of the bicycles that Shimano offers. We have started the flat-rate new hair restoration system ”Freedom” in Japan from April 2017. This new system was made from the technology of Hair Club, which is our group company in USA. Our customers enjoy spend daily life as natural as their own hair. We have renewed UV care product and renamed it as “Beau-stage UV Protect Premium on June 2017. We have new functions which our customer desired, such as “nature derived component” and “near infrared radiation block powder”. Our product, "SCALP GUARD Orgarich" series, which has acquired ECO CERT certification, won the Social Products Award in the domestic division of the Social Products Award 2017, from the Association of the Promotion of Social Products. "Any D'avray" is the fashion wig brand in Aderans France, which has received overwhelming support from women in the country. We launched its brand shop in Japan in 2015 and we will popularize that classy and elegant wig in Japan, which is loved by celebrities across the world. Mr. Michio Nozawa is known for beauty charisma called "Master of Match". Also, he has attracted a wide range of support from celebrities. In the future, we will make more fashionable and joyous wig proposals. We have supplied low stimulation shampoo, which rises foam from the beginning. This product is suitable for such as cancer patients who loss hair. We have improved former product with voice from nursing staffs who use it. In 2009, our staff members took the initiative to consider customer satisfaction and consequently made our Credo. It gives a common understanding between our staff at any levels of decision-making. 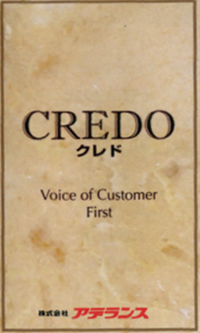 Credo is a belief, mission and promise that guide all business decisions. Our staff members think and work towards the same goal, that is to say, our corporate philosophy and credo. Our Credo, which started in Japan, extended throughout the world. Bacteriostatic finished lining nets have been used for medical wigs since 2013. This finishing enables us toprevent proliferation of bacteria such as highly contagious Klebsiellapneumoniae in wigs. Aderans sold its first medical-use wig in 2005, and all staff involved in sales at that time were required to attend a seminar on medical care presented by outside speakers. More than 2,000 employees have attended our medical care seminars, underpinning a system that allows customers to purchase products with peace of mind. 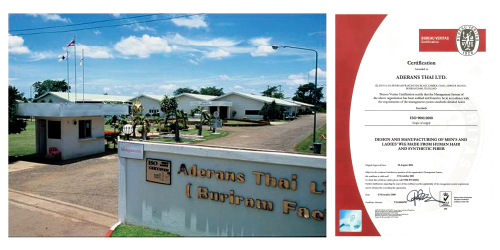 Our main production plant in Thailand has been certified ISO 9001 (international standard for quality management systems) in 1999 to ensure stable quality of our products. We haveour own certified engineer exam and training programmes. Our staff members at retail stores and in-house hospital salons are qualified as hairdressers and barbers. They have best techniques for styling wigs and offer services meeting diversecustomers' needs for hair. Our aim is to pass on our knowledge on hair and skin to our customers.To meet our goal, we became a member of Japan Hair Science Association and encourage our employees to attain hair adviser certification. To meet customer needs for hair, Aderans takes “After Service” as a big deal. Among them, we consider “Skill” as an important factor. We hold “National Skill Competition” where Aderans hairdressers compete to showcase their “Skill”. “Aderans National Skill Competition” is a tournament that chooses one person in “Barber Department” and ”Beauty Department” who has the highest technique among barbers and hairdressers from the workers of Aderans shops. We have held “Fontaine ready-made skill competition" from 2017. This is a competition that selects the person who has the highest customer service and technical skills. This was held for the first time as Fontaine against the backdrop of a rising demand for wigs in recent years. Its aim was to further improve of our company's strengths: "customer service strength" and "technical strength." To celebrate our 50th anniversary in 2018, we held the "Wig Design World Challengeship Award 2018" for the first time. With celebrating our 50th anniversary, in order to embody our management philosophy of "the best technology and knowledge," we will work together with Aderans Group as a whole, for further improvement of our technical capabilities. In December 2001, seeking to promote sound development of the hair industry and earn the trust of consumers, a group of 11 companies in the hair business, with a few companies, including Aderans, at the core, established the Japanese Hair Industry Conference (now, Japan Hair Industry Association). In the years since, the association has endeavored to enhance industry transparency by preparing guidelines for companies providing hair-related products and services and by maintaining industry order. With AIU Insurance Company, Ltd., Aderans Group has started cooperative businessfor interactive business growth since March 2014. AIU sells insurance that coversthe cost of medical wigs.It is the first attempt that medical wigs collaborate business with medical insurance. Japan Hair Industrial Cooperatives submitted JIS draft to Ministry of Economy, Trade and Industry. Through their deliberation over the application, it was approved as the world first national standard for wigs on 20 April 2015. In JIS process, Aderans Group played a leadership role in the industry. As medical wigs specified as JIS, we declared that all 20 products, our medical wig line, met all the applicable requirements of JIS. Japan Hair Industry Association granted us to use “Med wig mark”, authentication mark. This JIS process improved the quality of medical wig. To support people suffering from alopecia, we are aiming for medical wigs to be covered by insurance.